As the dust begins to settle after Saturday’s strange events, I’ve been made aware of this email which was sent out on Friday by Jack Gilbert, one of the leaders of Rainbow Hamlets, which represents LGBT people in Tower Hamlets. As you’ll see, Rainbow Hamlets had been part of the United East End coalition – a body that includes Mayor Lutfur Rahman, ex-Respect chair Glyn Robbins and the Rev Alan Green, who leads the Tower Hamlets Inter-Faith Forum and the IFE. This is the above trio with Wapping’s independent Labour councillor, Shafiqul Haque, a man you might well have wanted on the front line if violence erupted. And here’s Lutfur thanking the IFE brigade after the march. Rainbow Hamlets has played a strong role in developing an inclusive United East End coalition, which reaches beyond UAF and into other local communities. We also worked hard to ensure the dual approach of a cross-community event and a ban was adopted, and have actively supported both publicly. We remain unambiguously opposed to the EDL, to all forms of fascism, to all forms of hatred and to any prejudice and discrimination. However, we regret to report that activities undertaken in the name of United East End since Friday have not been the subject of any consultation with us. Indeed, we were shocked to discover we had not been party to key discussions, that literature bearing the UEE name giving false information was being circulated, and that misleading information about LGBT matters was being communicated at UEE/UAF events. Ensuring mixed public meetings are safe spaces for LGBT people, given the recent history of the area [see here], cannot be dealt with in such a tokenistic manner. We cannot have confidence this will be a safe space for LGBT people and therefore cannot continue to call for mass participation. In addition, a number of our members have voiced concerns about the UAF tactics themselves. To many, it appears likely this event will provoke a flout of the ban on marches and public disorder. Others argue that this is not the community-inclusive, family-friendly event originally envisaged and agree with the many political figures, who argue that this event is not the best way to oppose the EDL. Nonetheless, several members wish to attend because they want to make a clear statement against the EDL by being present. We all respect that and support their right to demonstrate, free from violence and any type of harassment. Our message to them is: do not go alone; stick with a few friends; keep away from the front lines; ensure you have used facilities just in case your movements are restricted; leave at the first sign of any trouble; if you experience harassment of any type, report it. We continue to work with community partners, the local authority and the police to ensure rights to demonstrate peacefully against the EDL are protected and to ensure the potential damage to the borough and to community relations is minimised. We hope Saturday goes off peacefully and that a strong message of opposition to the EDL remains. But what are the politics of Saturday? 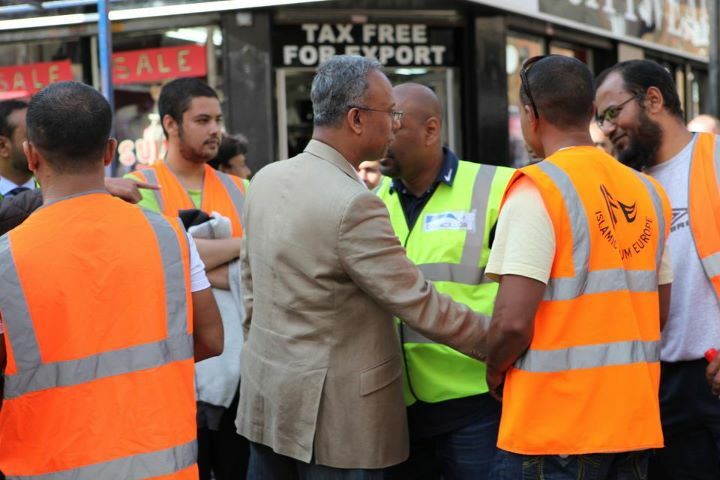 The images of Lutfur forming a barricade against a racist invasion into Tower Hamlets are sure to figure prominently in his re-election material in 2014. They will play brilliantly with his core supporters and fuel the spin that he’s the man of the people who stands up for his principles. He deserves praise for seizing the opportunity and the EDL are probably too thick to understand that they’ve played into his hands. But let’s not be fooled about who really stopped the EDL – it was the police. And why were the police out in such numbers? Partly because Unite Against Fascism, helped by Respect and tacitly supported by UEE, had bussed in several hundred people from around the country, many of whom would have been itching for a fight. The cost of the police operation will no doubt come out in due course but I imagine we’ll be talking serious numbers. As Labour had called for the UAF/UEE counter-demo to be cancelled, they will be able to exploit those numbers when taxpayers realise what they’ve had to fork out. However, the email from Rainbow Hamlets is fascinating. If anyone can shed light on why they were excluded from the discussions, do share.